A tremendous thank you to everyone who helped make our donations to the following families possible! Scott Millsap: We raised funds to pay for Scott's surgery from knee injury while working with longhorns. Tracey Jones' Family: Lost everything when a house fire destroyed their home. Joel and Shirley Lemley: We raised funds to replace fencing on their ranch due to fire. 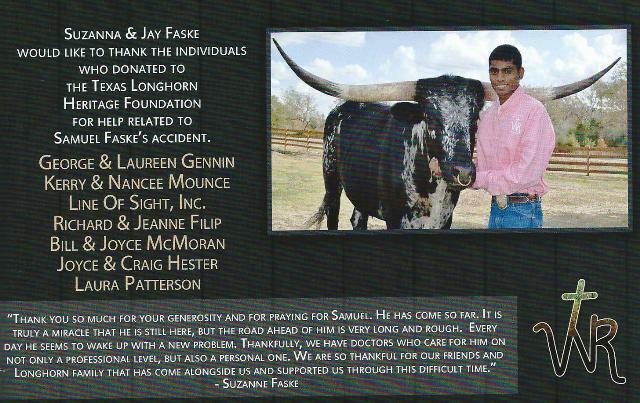 Samuel Faske: We raised funds to help pay medical expenses incurred when Samuel was involved in an automobile accident. 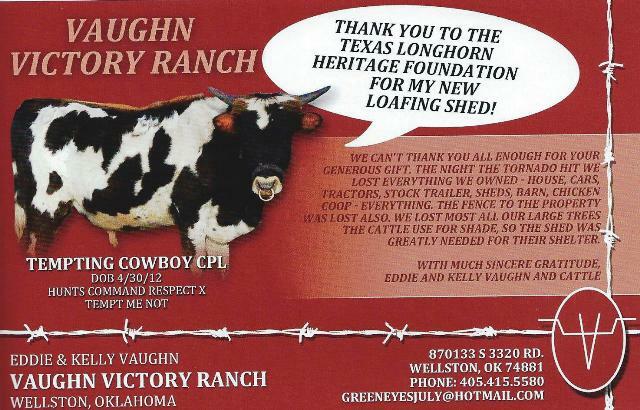 Eddie and Kelly Vaughn: We helped provide a loafing shed for their livestock after a tornado hit their home. Joel and Becca Miner: Their home was destroyed by Hurricane Sandy. The TLHF donated funds to help with building materials to construct their new house. They moved into their new home during March 2014. Tyler Menzell: The TLHF helped pay Tyler's tuition to the Monarch School, a special school for children with autism. The Dagmar Schaab Family: The TLHF paid for new fencing and for pasture cleanup for the Schaab family who were victims of a tornado in Farmersville, Texas.